How is it possible for a group of protesters, supported by the Student Representative Council and Black Student Movement, to hold the whole of Rhodes University hostage and possibly breach the South African Constitution and Bill of Rights at the same time? Why should a university of over 7 000 students shut down just because some students demand lower fees and a lower minimum initial payment? Similar scenarios are occurring at universities around the country. At the heart of this protest is the government’s failure to provide adequate funding to South African universities. Universities haven’t been supported by the department of higher education. And the National Student Financial Aid Scheme, which should be funding poor university students, is short of R51 billion. So if students want real change they should protest outside Blade Nzimande’s office. They have no right to disrupt thousands of others who are starting exams in less than two weeks, many of whom are struggling academically and desperately need this time to learn and study in peace. The Daily Dispatch reported that about 100 students, some of who carried sticks, turned people away from Rhodes campus on Monday morning. 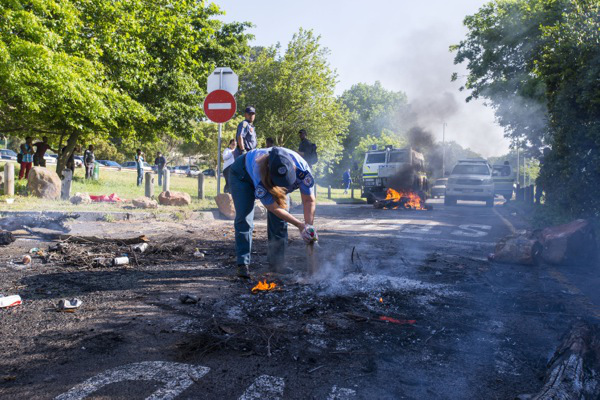 Section 17 of the Constitution states that: “Everyone has the right, peacefully and unarmed, to assemble, to demonstrate, to picket and to present petitions.” Burning tyres and barricading the entrances and exits of Rhodes to prevent lectures from taking place is not peaceful. Carrying sticks is not “unarmed”, and turning people away could constitute intimidation. Section 29 provides the “Right to Education”. Just because Nzimande and the government are blocking students’ rights to education does not give students the right to block other students’ rights to education. Section 12 protects “Freedom and Security of the Person” and Section 21 provides that “Everyone has the right to freedom of movement”. People trying to enter the cordoned off roads and being turned away by protestors carrying sticks does not amount to “security of the person” or freedom of movement. Freedom of movement is important and can be found in Article 13 of the Universal Declaration of Human Rights, part of its use being to prevent streets, roads and right-of-ways from being blocked or restricted. There is a duty for a private person not to impede the free movement of another. Where a person prevents another from freely entering or leaving an area, either by physically imprisoning them or by threats, that person may be subject to a lawsuit and criminal charges. Students and the public are being denied access to public thoroughfares, such as Prince Alfred Street and South Street in Grahamstown, and prevented from accessing a number of facilities for which they have paid money to attend ie lectures, tutorials, the gym and the swimming pool. They are therefore having their liberty infringed upon. Students who live in town have spent money on pre-paid meals in the Oppidan dining hall (which is shut), and now the Oppidan students must pay for meals they don’t eat or the university must pay for wasted food. Either way the protestors are causing a financial loss to another party. And what about all the students who have no access to computers and desperately need to use the university’s computer labs or library with final hand-ins and exams coming up soon? A whole range of liberties are infringed upon by shutting down an entire university, and in my opinion it is possibly a criminal offence to close a university rather than to crack down on the action of the protestors. The police should deal with this swiftly and make sure public thoroughfares are clear, people are secure and their freedom and liberty is not being obstructed in any way. The university leadership and campus protection should make sure the university stays open at any cost. It might also be necessary to start a student movement called the Non-Racial Student Movement. At least the name would be more constitutional and many students would feel more comfortable joining it than joining the Black Student Movement or Student Representative Council. A non-racial student movement would attract a variety of individuals with different views and philosophies and would be a good way to balance out any one-sided outlook. It could act as a counter-movement representing the students who want to keep on studying, and it seems to be the only means of coordinating students who are opposed to the Student Representative Council and Black Student Movement protest action. Such an organisation would enable collective action on behalf of the students who want to mind their own business and get on with their studies. At present, there is no platform for this large group of students because in my opinion the university management, government and police have failed to act on their behalf. Geoff Embling is a teacher, writer and political activist.